Address: Calle Máximo Gómez 32, Centro de la cuidad Baní, Provincia Peravia, Baní (Gran Santo Domingo), Dominican Republic. 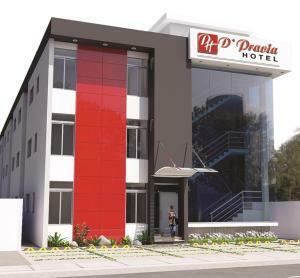 Offering a restaurant and free WiFi access, Dpravia Hotel is located in Baní, Dominican Republic. Marcos A. Cabral Park is 6 minutes' walk from the property. A flat-screen cable TV and a patio with a garden view are featured in all Dpravia rooms. A dining area and minibar are also included. The private bathroom is equipped with a bath, shower, and free toiletries. A bar is available for guests to enjoy at Hotel Dpravia. A 24-hour front desk, tour desk, and concierge service are offered for convenience as well as grocery deliveries, meeting facilities, and free parking. Our Lady of Regla Hospital is 1.3 km from the Dominican Republic hotel, and Our Lady of Regla Cathedral is 400 metres away.